Mit einer Materialstärke von lediglich sechs Millimetern eröffnet „Paint“ viele kreative Kombinationen, so zum Beispiel mit der neuen Feinsteinzeugserie „Kalmit“ von Gres Steuler. So kann die zu „Paint“ passende Serie „Kalmit“ nicht nur getrennt von ihr auf dem Boden eingesetzt werden, sondern ermöglicht gemeinsam mit ihr auch eine eindrucksvolle Allianz an der Wand. Dies bietet ganz neue Gestaltungskonzepte, da die beiden Serien sowohl in ihrer Materialstärke als auch im Rastermaß von 119,8 cm kompatibel sind. Bei der Einführung neuer Formate wie das jetzt präsentierte Format 40 x 120 cm stellt Steuler ab sofort mit „Pure White“ immer das passende Weiß-Programm in einer matten und einer glänzenden Ausführung zur Verfügung. Gleichzeitig wurde das bereits existierende Format 30 x 60 cm mit jeweils ein weiß-matten und einer weiß-glänzenden Ausführung in 6mm-Materialstärke ergänzt. The creative department in Mühlacker was inspired by the so-called squeegee technique when developing the new “Paint” stoneware series. No less a figure than the most famous contemporary German artist, Gerhard Richter, prefers to use this painting technique. Richter, the most expensive living artist – applies oil paints to the canvas in several layers using a “squeegee”. It is well known that the drying process for oil paints is a bit longer and so the artist can still change the flow of the individual layers even hours later, allowing them to merge into one another in large areas or in stripes: in this way, predictable and controlled progressions of colour are created, but also cloud-like patterns and textures resembling natural shapes are produced according to the principle of chance. The work of art is given dynamism and depth. So is “Paint”. It shines out in the three colourways of translucent grey, translucent beige and mother of pearl. 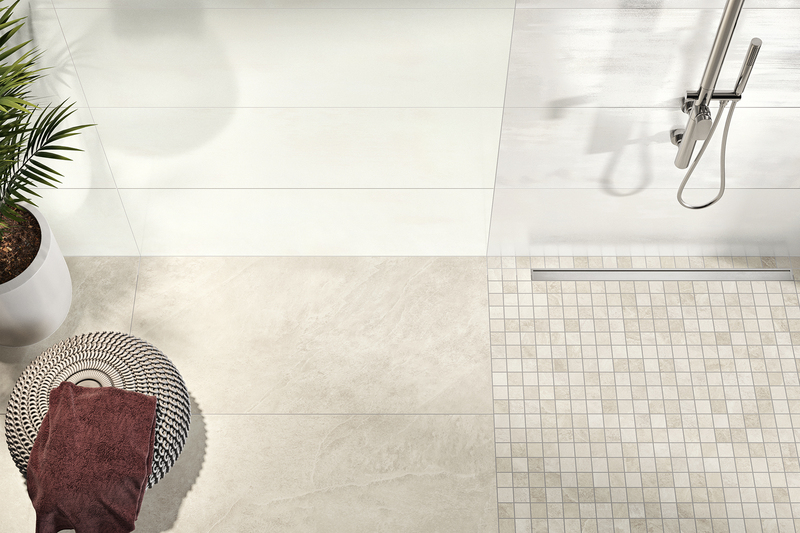 And while the first two shades only expose their patterns very delicately, the mother of pearl coloured contrast tile self-assuredly reveals its graceful diversity. 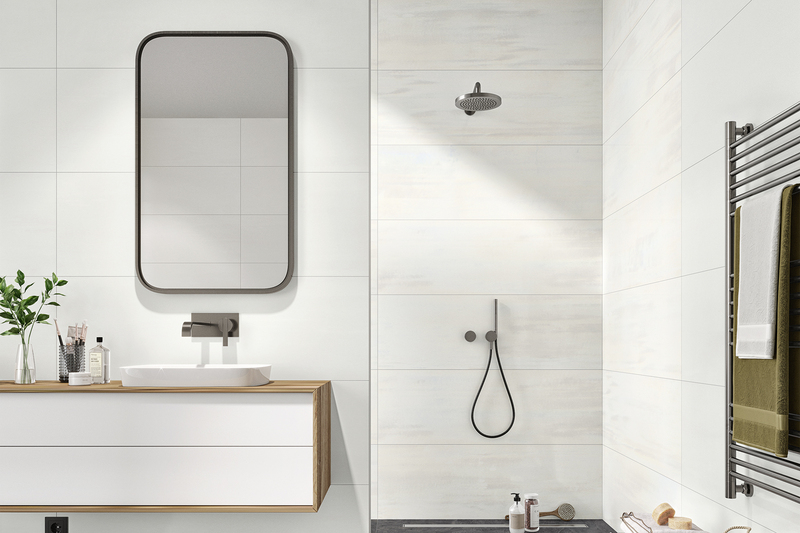 As a decorative tile, preferably used to border or emphasise certain areas – such as behind a wash basin – it provides a perfect complement to the two plain tiles. “We don’t have a vague idea here,” says Stefan Grimmeisen with a wink, "but rather a multi-faceted, elegant mother of pearl effect”. This is shown off particularly well in the rectified 40 x 120 cm format that has recently been added to the range. “Thanks to high-resolution scanning of the patterns, a wide range of images can be created, which we can reproduce in the digital printing process,” Steuler’s Head of Marketing explains the decoration process. Decoration is provided by mosaic mats using a mixture of the “Kalmit” porcelain stoneware series and the stoneware material. 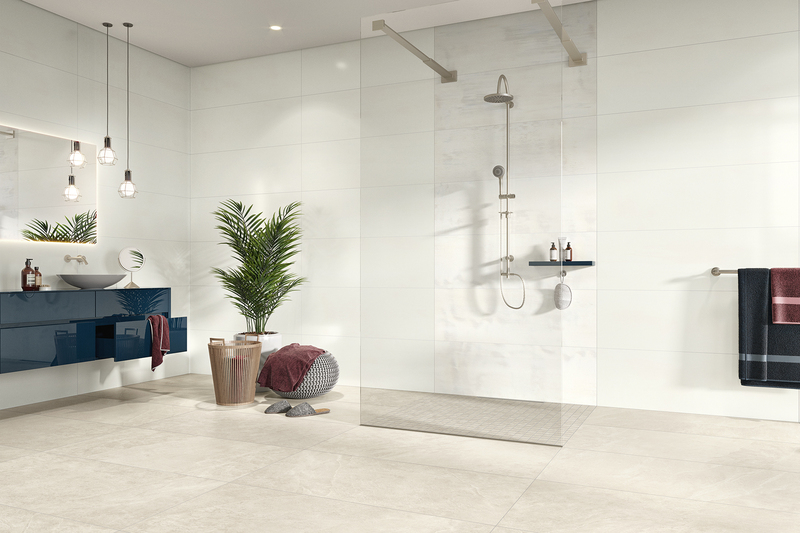 With a material thickness of just six millimetres, “Paint” opens up many creative combinations, for example with the new "Kalmit” porcelain stoneware series from Gres Steuler. This means that the “Kalmit” series that goes with “Paint” can be used separately on floors but also allows an impressive alliance when used with it on walls. This offers totally new design concepts since both series are compatible both in terms of their material thickness and also their grid dimension of 119.8 cm. 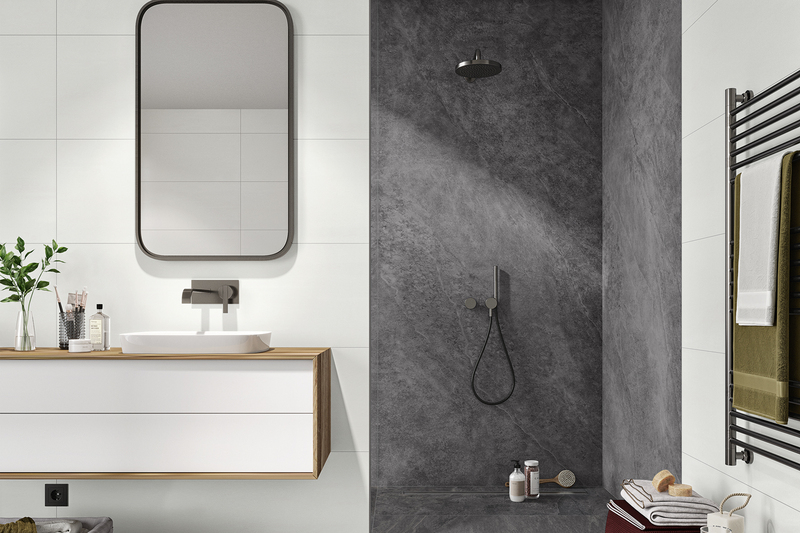 From now on, Steuler will always provide a matching “Pure White” range in a matte and glossy finish in future when introducing new formats such as the 40 x 120 cm format presently being launched. At the same time, a matte white and glossy white finish in the 6 mm material thickness were both added to the 30 x 60 cm format that already existed.